A regatta around the Isle of Beauty, combining the spirit of competition and sportsmanship, elegance and adventure, under the patronage of the prestigious Yacht Club of France. The Corsica Classic is a highly exclusive sport and lifestyle event, part of a renowned tradition of stunning Mediterranean regattas for classic yachts. All classic yachts, approved by the CIM (International Mediterranean Committee) and yachts in the “Esprit de tradition” class, approved by the IRC in 2018, are eligible to enter the race which is part of the official circuit organised by the CIM and French Association of Classic Yachts (AFYT). Over the past 8 years the Corsica Classic has become a not-to-be-missed event on the Mediterranean sport and lifestyle calendar and remains the only classic regatta sailing around Corsica, and the only one in the international circuit to be set in august, just before the Vele d’Epoca d’Imperia in Italy (5 -9 september), the Régates Royales in Cannes (24-29 september) and the famous Voiles de Saint-Tropez (1-7 october). Yachting! The regatta is under the patronage of the Yacht Club of France since 2014, a mark of great prestige. The YCF will be giving a very special Prize at the closing ceremony to the most Fairplay Sailing Yacht. Created in 1867 by Napoleon III, the highest sailing institution in France has had very prestigious members, such as the polar explorer Charcot, Jules Verne or Eric Tabarly. Every year, the Yacht Club de France offers its prestigious “Tape de Bouche” to the most « fairplay » winner of the Corsica Classic. Route! Ajaccio, the Sanguinaire Islands, Propriano and the Gulf of Valinco, Senetosa, Bonifacio, Lavezzi Islands, Saint-Cyprien bay, Bavella, Sari-Solenzara, Bastia, Macinaggio, Saint-Florent : names that conjure up visions of the Isle of Beauty; iconic landmarks dotted along the route of this seven-day race. Each day, the yachts will follow a coastal route of around 20 miles, a distance that will take at least 2 ½ hours to navigate on the shortest days, and up to 8 hours on the longest. Arriving at their overnight moorings, competitors will find exceptional port services and stunning backdrops. Competitors! 20 of the most stunning classic boats on earth will participate in the regatta this year, with competitors from Monaco, Switzerland, Italy, Spain, France, England, Germany and the USA. 2013 and 2015’s 2016 triumphant victory was Tara Getty (UK) with SY Skylark (1937), the flagship yacht of the Los Angeles Yacht Club. Getty is back with his yacht this year and the fight will be grandiose. Sailing for all ! The regatta also welcomes for the fourth year Patriarc’h, an associative schooner that welcomes children in social reintegration and their educators who will participate in this week out of time. Official Poster // Every year, the winner over all of the Corsica Classic is honored on the official poster following his trophy. 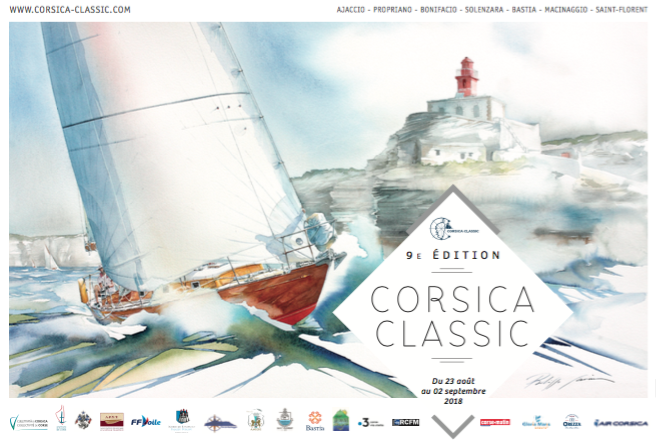 The Corsica Classic 2018 official poster depicts the Olin Stephens plan, SY Arcadia, built at the Silvestro shipyard in Nice in 1969, led by Bruno Ricciardi’s crew, in front of the port of Bonifacio and Madonetta. The artist Philippe Gavin sketched on canvas this sublime classic yacht. A passionate yachtman, Philippe Gavin has been participating for several years in Classic Yacht regattas aboard legendary sailboats such as SY Tuiga, SY Moonbeam IV or SY Arcadia... His escapades on the water nourish his Work and allow him to render with realism the actions of regattas by revisiting the marines’ classic style with watercolor. Dinner on the beach // Romuald Royer, young star chef of the Lido in Propriano and rising star of the gastronomy of the island, will orchestrate a dinner for the 150 participants expected at the Corsica Classic on Monday 25 August for an exceptional evening in Bonifacio’s historic monument, Bastion de L’Etendard, including a breathtaking view on the cliffs and the fleet in the harbour. Corsican Roots // With its course between Ajaccio and Saint-Florent, the regatta will stop in 7 ports along Corsican shores. Thanks to the support of these ports, grouped by the UPPC (The Union of the marinas of Corsica, which federates the ports of the island), presided over by Jean Toma, the mayor of Sari-Solenzara, it becomes for the first time a partner of the race. The event is actively supported by Corsican entrepreneurs such as Gloria Maris (fish), winegrowers (Granajola, Clos Signadore, Blue Wine ImaJYne), Pietra (breweries), Orezza (corsican water), Mattei drinks (cocktails and juices), Château Nasica (olive oil), restaurants and hotels along with the major Corsican authorities. All these actors of the island will be put forward to make discover their know-how and the excellence of their products, Made in Corsica.